MacDraw was a vector based drawing application released along with the first Apple Macintosh systems in 1984. MacDraw was one of the first WYSIWYG drawing programs that could be used in collaboration with MacWrite. MacDraw was useful for drawing technical diagrams and floorplans. It was eventually adapted by Claris and in the early 1990s MacDraw Pro was released with color support. 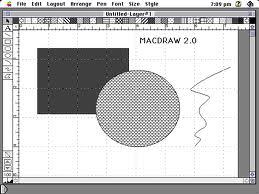 MacDraw is the vector edition of MacPaint.